At Pine Ridge Campground we welcome you with the best of service, with a family-friendly atmosphere. The newest of amenities at your campsite, as well as great activities and recreation nearby. Come visit us at Pine Ridge Campground and show you what you have been missing from a seasonal campground, we won’t disappoint. Click the boxes below for additional information, then check out our rates or register for a seasonal site today! Our campground area features an estimated 7-acre limited tree cover campsites and 10 acres of wooded camping sites. When Pine Ridge Campground is fully completed, we will have an estimated of 95 RV sites & 20 tent camping sites. Each and every campsite at Pine Ridge Campground features brand new & up to code 20, 30, & 50 amp service panels. Our electrical service is brand new as of 2017 with heavy duty underground electrical lines, and brand new service panels certified 3rd party tested electrical meters. No blackouts here during heavy service usage! Due to Pine Ridge Campground being constructed in 2017, we fall under the new water treatment and supply standards of Pennsylvania’s DEP. We have a state of the art water filtration system & thousands of gallons of water storage onsite. Our water pressure maintains a constant 65 PSI, for the best water flow for all our campers. At Pine Ridge Campground we provide free honey pump services for our campers. Monthly campers are on sewer sites. Yearly seasonal campers are pumped when their pump card is deposited at the office drop box. We do not hire outside commercial sewage services to pump any campers! (No damaged tanks, or unknown staff, etc.) And best of all, this service is included with your seasonal rate! 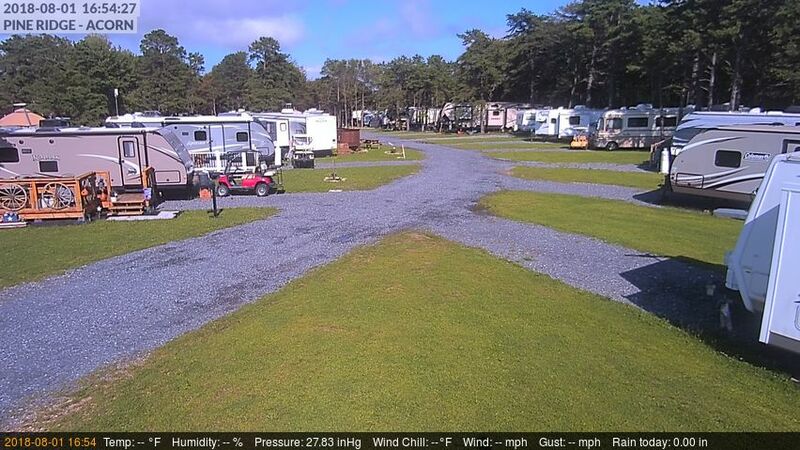 All Pine Ridge Campground RV sites feature a 6″ thick base of slate stone compaction along with 3″ thick top of 2B stone for a total of 9″ RV pad sites. At Pine Ridge Campground, we are against all stone sites! No one goes camping to live in a parking lot. All RV sites feature a 10’x50′ stone pad for your RV & vehicle, and the rest is grass or woodland. In April of 2017 & May of 2018 for our additional sites, we hydro-seeded every RV site to provide the best grass seed to grow for a golf course like look! You get a picnic table; you get a picnic table, you get a picnic table! Every site gets a heavy duty, sawmilled extra strength picnic table. These tables are not going anywhere, and may require four people to move too! Firepits are provided to all campsites, you may also bring your own firepit. Pine Ridge Campground features a state of the art wireless internet system throughout. No wifi hotspots here, our whole campground has wireless internet at every RV site, tent site, recreation areas, even our neighbors have free wireless internet! We even provide FREE service and a premium faster service speed for the camper in demand to stay in touch with the outside world. Pine Ridge Campground provides a free use dump station to our campers. While most of our campers are seasonal and will be honey pumped. You may dump at our dump station 24/7/365 at no charge! We promise we won’t hunt you down for that $10 fee. Ice Ice Baby!! We have ice available for purchase onsite. We’re not going to price gouge you either, just $2.00 for a 8# bag! Yes, we’re most likely cheaper than your local grocery store, or gas station. We have firewood on site for sale to all campers, monthly, yearly, tent or RV camper. Again we hate price gouging, we won’t give you 6 logs for $5. For $20 we give you a load of firewood delivered to your site containing 40-45 pieces. Seasonal campers are also permitted to purchase large loads of firewood from our approved sources. No outside firewood permitted inside our campground unless approved. Pine Ridge Campground works exclusively with Hellers Gas Co. and has negotiated park rates. No other gas provider is permitted for delivering within Pine Ridge Campground. Our park rates include hooking up a 100# tank at no labor cost, and the only cost will be for materials for converting from small cylinders to the much larger tanks. To get this park rate, you must contact the Vice President of Sales at Heller’s Gas, Mr. Troy Zeiber at his cell phone (717) 304-9798 to setup your account to to receive this discount. Tell him Jamie from Pine Ridge Campground sent you! Simple, no storage fees to keep your camper on your site all winter long. Why do campgrounds charge this fee?! Pine Ridge Campground currently has Deluxe Modern Cabin Rentals & a Tiny House Primitive Cabin for daily, weekly & monthly rentals. To book our rental cabin, please check our availability! Pine Ridge Campground recently constructed a brand new 60’x40′ pavilion for our campground activities and for our seasonal site holders use. Our seasonal site holders also have the ability to rent the pavilion area for their use. Pine Ridge Campground is located just a few hundred feet from the Big Flat Appalachian Trail entrance. Parking is provided at the Big Flat entrance too! We’re also only a few miles away from the midpoint of the trail! What can be better than that? Pine Ridge Campground is located just a few hundred feet from the PA DCNR ATV Trails parking lot entrance. 36 miles of premium ATV trails. Pine Ridge Campground does not allow riding of ATV’s in the campground but permits ATV to be stored on trailers, and transported to the ATV parking lot. More information can be found here! Pine Ridge Campground is located 4.7 miles from Long Pine Run Reservoir. Long Pine Run is a quiet destination and is a little gem. The reservoir is located in the Micheaux State Forest and because there are no picnicking or camping facilities in the immediate vicinity, the people are much fewer than in a state park. The lake has approximately three miles of shoreline, most of which is mixed hardwood and pine forest. While small motorized boats are allowed, the canoes, kayaks and occasional small sailboat are the norms. If it is peace and quiet you seek, Long Pine Run is a good bet. While Pine Ridge Campground is fairly new in development, we do plan on constructing our pavilion & pool in the near future. But in the meantime, located just a few miles away are many state parks, lakes, public pools, & pavilions.